The steps below will explain how one can edit any given Grok article. If you would like to change or edit your own documentation but do not see the "Edit Article Content" button (seen below in step 4), you may need to be added as an editor. 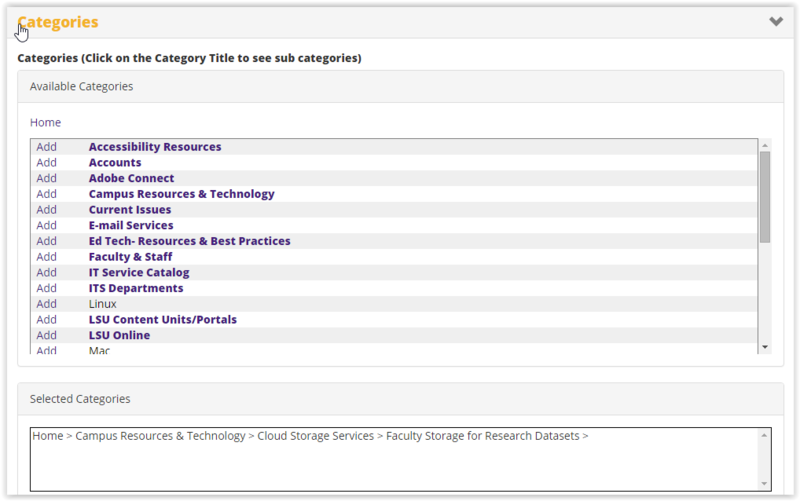 If you'd like to be added as an editor to a given article or set of articles please email itservice@lsu.edu with the subject "Requesting Grok editor privileges". Please be sure to include any details that may be pertinent, e.g. you are a new hire and have been tasked with updating Grok documentation for your given group. 1. Open the GROK Knowledge Base (grok.lsu.edu). 2. Click on the Login button. This is located in the upper, right-hand corner. 3. Open the GROK Article that you need to Edit. 4. Click Edit Article Content link. This is located at the top of the article. 5. Make the necessary Changes to the content in the article in the Body text box. This is located under the Body tab. 6. Make a Comment on the changes that you just made to the article in the Comments on this Revision text box. This is located under the Required Settings tab. 7. (Optional) Check and update the Expiration date of this article. This is located under the Required Settings tab. NOTE: The Maximum Time Allowed is 1-YEAR Before Expiration. When an Article Expires, it is placed into the Queue to be Reviewed by the Knowledge Steward of the Content Unit. When an Article Expires, it is flagged as Expired in the Public View. 8. (Optional) Check and update the Categories where this article displays. This is located under the Categories tab. Read more on Adding & Removing Categories. 9. (Optional) Click Save As Draft if you would like to continue working on the article at another time. This will save the changes that you have made to the article in Your Personal GROK Queue which is located on the GROK Editor Homepage. 10. Once all changes have been made, click Submit for Approval.